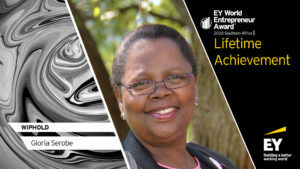 The 2018 Lifetime Achievement Award was presented to Gloria Serobe at the EY World Entrepreneur Award ceremony on Thursday, 29 November 2018. The award recognises prominent business people whose enterprises have contributed significantly to the growth and development of the economies in their respective countries. Gloria has received many accolades and awards throughout her career – and has been widely recognised for her outstanding contribution towards creating social and economic change in South Africa, and for the empowerment and development of women, particularly those in rural areas. As the Founding Member and Chief Executive Officer of Women Investment Portfolio Holdings (WIPHOLD), she has earned a distinguished reputation as a leader in the South African business world. Apart from her leadership role within WIPHOLD, Gloria serves on several boards. “I am flattered by this award. As it is difficult for women to get the same opportunities in business as men, all we wanted to do as WIPHOLD was to create a critical mass of women in business, as opposed to each one doing their own thing. There must never be a time again when a woman who wants to open a business goes through what we went through,” says Gloria on accepting her award. 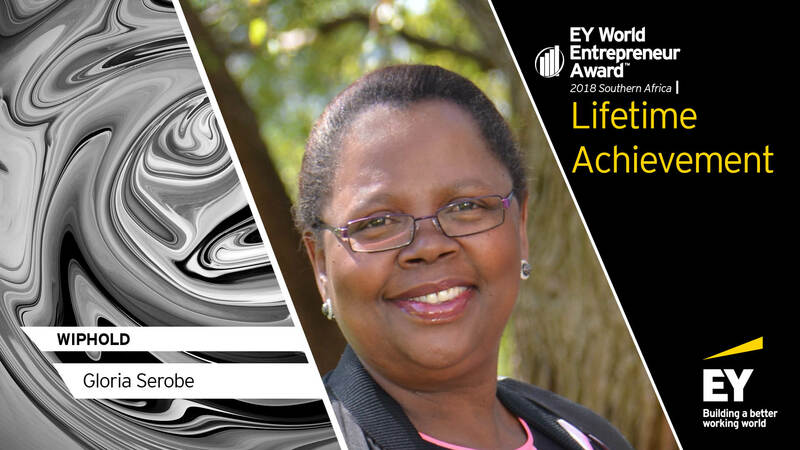 EY is honoured to recognise Gloria Serobe with the 2018 Lifetime Achievement Award. This award acknowledges and celebrates the significant contribution she has made to Southern Africa by changing the game of her industry. She is a founding member of South Africa’s first and most successful black women-owned investment company focused on acquiring and building strategic investments in key sectors of the economy, that in turn offer value and returns which WIPHOLD has used to drive broad-based empowerment initiatives for more than two decades. “The EY World Entrepreneur programme is a powerful reflection of our purpose to build a better working world. At EY, we celebrate the innovators who dare to think differently and whose relentless pursuit of excellence drives positive change and sustainable economic growth in the Southern Africa region. EY’s global platform allows these entrepreneurs to compete on a global scale, as will be witnessed at the final round of this award in Monte Carlo in 2019,” says EY Africa Markets Leader, Roderick Wolfenden. The EY World Entrepreneur Of The Year™ Awards is a culmination of the regional programmes and is held in June each year in Monte Carlo, where entrepreneurs from over 60 countries around the world compete for one of the most coveted global business awards. This year, Founder of Mobicel Communications Ridhwan Kahn and winner of the 2018 Master Category, will be representing Southern Africa as one of the finalists eligible for the prestigious title of World Entrepreneur Of The Year™.